The Wicklow senior footballers got their chase for promotion back on track, after a late Theo Smith goal helped them on their way to a hard-fought win against Limerick on a wind-swept afternoon in Aughrim. In a physical affair in difficult conditions on Suday, two priceless second-half goals from Chris O’Brien and the aforementioned Rathnew man helped Wicklow avenge last week’s defeat to Leitrim, while also handing Limerick their first loss of the 2019 campaign. A swirling and persistent wind did not facilitate for a high-scoring game in Joule Park. Instead, it was always going to be won by whichever side took advantage of breeze being at their respective backs. John Evans’ men went about winning this vital battle early. Stephen Duffy — one of three changes from the team that lost to Leitrim last week — opened Wicklow’s account with a monstrous point from beyond the 45-metre line inside three and a half minutes. That was followed by a Duffy free, and an excellent strike from Chris O’Brien coming off the right flank, as Wicklow raced into an early 0-03 to no score lead. Limerick finally got their first score of the game eight and a half minutes in from a Seán McSweeney free, before Jamie Snell intercepted a loose pass to work the ball onto the irresistible Dean Healy to restore Wicklow’s three-point advantage. O’Brien got his second point of the afternoon, before Theo Smith struck an absolute peach of a strike near the 45 from a standing start with the outside of his right foot, as Wicklow turned their possession advantage into scores. Limerick would get the final score of the half with five minutes remaining, and in bizarre fashion. Seán McSweeney went for the posts with a free on the left-hand side. On any other day, the ball would have flown over the bar routinely. However, the wind instead took the ball high in the air and comically blew it back to where it had been taken. The visitors did manage to work the ball across for Colm McSweeney to drill over, but it was a sequence that best demonstrated just how uncooperative the weather was being on the day. The Garden men finished the half strong, but struggled to expand on their lead in the same way that their female counterparts had done earlier in the day. Patrick O’Toole pulled a shot wide under pressure, before that same man won a Limerick kick-out for Chris O’Brien to also miss the target. Stephen Duffy had the final chance of the half, when he pulled another strike from beyond the 45 wide, as Wicklow went in with the lead. The knowledge of the wind being at the backs of the likes of Tommie Childs making surging runs from deep made the first 10 or so minutes of the second-half potentially hazardous for Wicklow. That anxiety was made all the worse when Seán McSweeney slotted a free over the bar after winning an attacking mark. Stephen Duffy got another point off of a clever reverse pass from the outstanding and warrior-like Darragh Fitzgerald to restore Wicklow’s three-point advantage, only for the visitors to rebound. Colm McSweeney reduced the gap to two, just two minutes after Wicklow and Baltinglass goalkeeper Mark Jackson had put a free wide. Just a minute after McSweeney closed the gap, Limerick turned the game on its head with a sucker-punch goal. Bearing down on goal, Seamus O’Carroll took a pop at goal, only to be denied by a good save from Mark Jackson. Unfortunately, the Wicklow rearguard failed to clear, allowing Brian Donovan to work the ball back to O’Carroll, who put the ball into the back of the net at the second attempt. One couldn’t help but get a sense of deja-vu from the Leitrim game last week, when Ryan O’Rourke scored a dramatic goal to dash Wicklow hopes. However, rather than shy away in the same way that they did that afternoon, John Evans’ troops instead put in a magnificent final 20 minute display to turn the game around and keep the points in Aughrim. Four minutes after falling behind, Stephen Duffy claimed back possession, allowing Patrick O’Toole to find Chris O’Brien. The AGB man evaded a tackle from behind to put the ball into the bottom left-hand corner. Mark Jackson slotted a free following a foul on the tireless Dean Healy, before Darragh Fitzgerald and David Devereux combined brilliantly down the right-hand side, giving Devereux the task of lifting the ball towards Theo Smith, who climbed above the Limerick goalkeeper to fist the ball into the net. With eight minutes left, Wicklow had stretched out to a 2-08 to 1-06 lead. Limerick would try as best they could to reverse the arrears, only to be met by Ross O’Brien, Oisin Manning, and Mark Kenny anchoring a stubborn Garden back-line. Wicklow held out for the points, and their second league win out of three, to keep their promotion hopes alive and kicking. 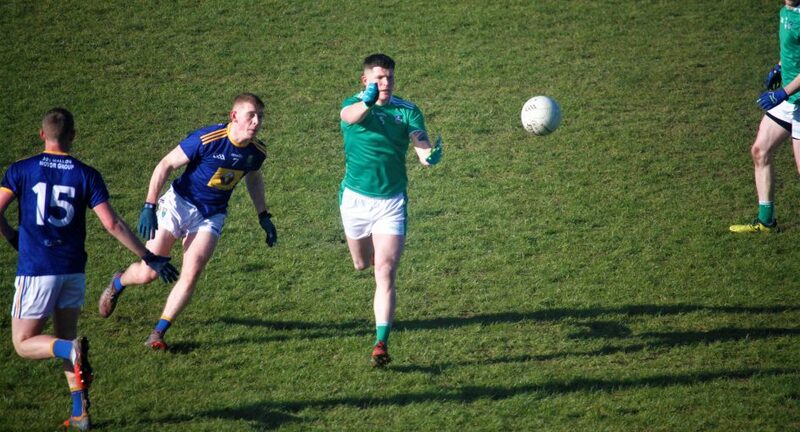 WicklowNews Player of the Match – Darragh Fitzgerald. Wicklow: M. Jackson; O. Manning, R. O’Brien, J. Snell; D. Devereux, S. Mooney, D. Fitzgerald; P. O’Toole, D. Healy; M. Fitzsimons, M. Kenny, T. Smith; C. O’Brien, S. Duffy, P. O’Connor. Replacements: D. Keane (for M. Fitzsimons), C. Healy (for T. Smith), F. O’Shea (for C. O’Brien), E. Murtagh (for S. Duffy), P. McLoughlin (for P. O’Connor). Scorers: C. O’Brien (1-02; 0-01f), T. Smith (1-01), S. Duffy (0-03; 0-01f), D. Healy (0-01), M. Jackson (0-01f). Limerick: D. O’Sullivan; S. O’Dea, G. Noonan, P. Maher; C. McSweeney, I. Corbett, C. Fahy; D. Treacy, T. Childs; P. Nash, J. Lee, B. Donovan; S. McSweeney, P. Begley, S. O’Carroll. Replacements: M. Donovan (for P. Maher), S. Keeley (for T. Childs), M. Fitzgibbon (for P. Nash), K. Daly (for J. Lee), A. Enwright (for B. Donovan). Scorers: S. O’Carroll (1-0), S. McSweeney (0-03f), C. McSweeney (0-02), J. Lee (0-01).